So it begins high in the Beaverhead Mountains, the Big Hole River flows for 153 miles through a fly fishing wonderland filled with Brook, Rainbow, Brown and Cutthroat trout. The Big Hole is the last remaining habitat for fluvial Arctic Grayling in the contiguous United States. Along the Big Hole corridor are fishing access sites with names: Jerry Creek, Divide, Maiden Rock, Salmon Fly, Notch Bottom, Pennington Bridge until the Big Hole joins with the Beaverhead River. Sliding along the Pioneer Mountains, the Big Hole River becomes world class for pocket water as the river gains momentum slicing into the Canyon section, it becomes the destination for anglers during the prolific Salmon Fly Hatch in June. One of the most quintessential pieces of landscape in the American West is the “Notch”. This is where the Big Hole carves a groove through two pillars of rock. The Big Hole then meanders through the cottonwoods and meadows melding with the Beaverhead just north of the town of Twin Bridges to create the Jefferson River. April and May – Pre Run-Off: Our guides have taken solemn oaths that on the Big Hole, the biggest fish of the year are caught in the months of April and May before the spring runoff. We have taken a solemn oath not to say where on the Big Hole, but can easily arrange a fishing trip in search of the lurking lunkers lounging in the languid waters of spring. A Purple Chubby with a San Juan Worm as a dropper is a fly for all seasons on the Big Hole. This combination can be infallible casting to the big boulders in the upper river while being equally deadly along the undercut banks from Maiden Rock downstream. June – Salmon Flies: Salmon Flies are extraordinarily large insects that hover over the Big Hole in June. These flies defy the laws of flight as they bumble along, skimming the surface while becoming one of the most enticing hatches for trout as well as the anglers pursuing them. There is a great joy in tying on a size four dry fly that can be seen from space while having a very large trout attack it on the surface. July and August – Tricos, Mayflies, Moths: Tricos and tiny mayflies, start erupting along the Big Hole in the summer months. These tiny flies become a substantial hatch for hungry trout. 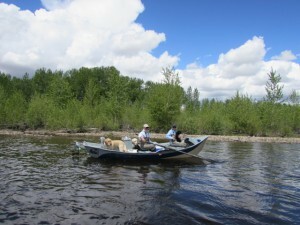 With a little luck and a little cloud cover they offer wonderful dry fly fishing opportunities. Another signature hatch on the Big Hole are Spruce Moths enticing trout to the surface. This hatch can be seen on the entire length of the river, creating 153 miles of angling bliss. September and October – Blue Winged Olives, Hoppers and Streamers: Fall is easily the best time of year in Montana. There isn’t another season that expresses the tenuous nature of life more poignantly than autumn. September and October beckon to all anglers with Blue Winged Olives hatches, Hopper patterns, and a call to reach for the streamers in your fly box.